Has Apple jumped the shark or is app complexity out of control? I was recently using my mac. I say that in jest. Because like all digital creatures, moderns, everyone with a pulse these days I suppose, like all those people I use my mac everyday. So when I see something strange, it’s rather jarring. Because when you use a device everyday, you become quite familiar with it. And with that familiarity comes comfort. So what to my surprise when I was doing a task I do very often. Simply trying to add a contact from email into my address book. And I got the lovely and strange dialog you see above. Now to most users it might not scare them much. I mean you know, just click one or other. Simple right? Wrong! As a long time database admin, I know that before you ever delete *ANYTHING* you make a backup first. Now in the above scenario, the backup menu item is blanked out. You cannot do a backup first. Unless you go to system backups. Of course I did that, and that took me on a multi-hour wild goose chase, that is still not resolved. Why not choose that option? Well for me my contacts database is sort of sacred. It’s where I keep track of everyone I’ve ever worked with. Now I never gave Linkedin permission to write anything to my contacts database, so who knows if they got in there, or how. But I certainly don’t want them in there. If I click keep, how the *heck* will I ever get thousands of contacts out of my database again? Sadly, this is the state of computing these days. 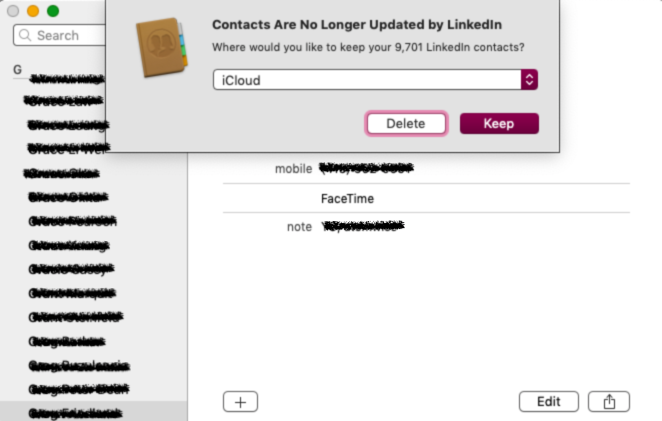 I don’t know if I was accidentally tricked into *allowing* linkedin to dump its contacts into my database, or if an upgrade changed some default, sneaking the data in there through a side channel. Whatever the case, I’m stuck now. And Apple was supposed to protect us from this craziness. Apple where’ve you gone? Related: Do Linux & Apple tell the Gilgamesh story of hacker culture? This may be the ultimate culprit. As more apps hit the app store, and more codepaths lay dormant, more bugs or call them surprise features, lay undiscovered. With all these power we have in our hands, it seems it is devolving by day, into a bigger and bigger mess. Related: Is Apple betting against big data? Next PostNext What types of management problems plague startups?